“You are not allowed to poster here!”, one of our members was told, before having all their posters confiscated. Yes, thank you, we know we are not allowed to poster, that’s what our posters are about. ‘This is public space. And you can’t see it.’ ‘This is public Space. And you can’t use it.’ Such is the situation on the University of Kent campus. The campaign started after we had struggled to publicise our events and draw in people to our precarious organising group and draw awareness around the treatment of precarious staff at our university. An email had been sent from the head of estates complaining that the sticky residue of our posters was difficult to clean off. In light of the sticky residue email we asked to talk to estates about the poster-hostile environment, but were informed that talks were already taking place between estates and the Kent Union to provide “such facilities”. If “such facilities” is anything like the two small glass boxes placed off central campus that the UCU were given for their postering, then this is something to be highly sceptical of. Current facilities are subject to high levels of control, and Kent Union forbids any posters (not even ones about missing cats) that do not have their official approval and logo on them. Yet, even Kent Union affiliated student societies are feeling the strain, with declining membership and attendance at events. The question then becomes: If you are not allowed to poster anywhere and the information screens around campus are under management control, how do you create community? Community needs sticky residue to keep it together. When our first round of poster went up, it was anonymous, we wanted campus to be reclaimed for everyone and not just for our own campaign. Murmurs started spreading around the university, you heard it in seminars, and in hallways, as well as down the pub, that little blue posters had started popping up everywhere questioning the way that space is policed – and no one knew who was behind it. But then, a few days later, one of the colleges overlooking the footpath up to the University was graffitied with explicit fascist imagery. Public space was not just under threat from corporate managerial regimes, but from far right hate speech as well. This is when we decided to escalate, and put our name to the campaign. 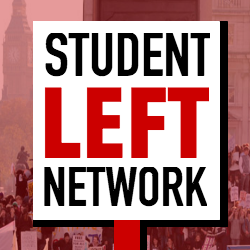 So, the next day we put up large posters dismissing the far right and encouraging people to talk about issues they were facing at university – to reclaim campus as a public forum. To begin with we got some good responses, but soon our posters seemed to evaporate… Not like the blue ones which had been taken down after a day or so, but within minutes of being put up. Some places we were even barred from postering at all… Someone seemed to not like the idea of giving students a voice and room to express themselves.